Style and functionality meet with this fun metallic LED desk lamp. 3W LED output and flexible chrome gooseneck allow you to point the light exactly where you need it. ON/OFF switch is located on the cord for convenience. Perfect for office, kids room, or college dorm! 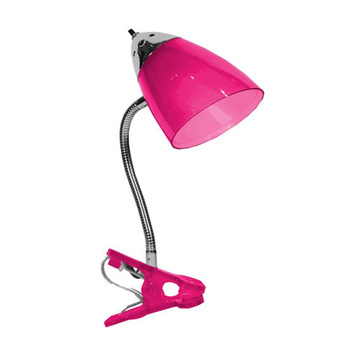 Style and functionality meet with this fun clip lamp. Comes equipped with durable clip. The flexible chrome gooseneck allows you to point the light exactly where you need it. ON/OFF switch is located on the shade for convenience. Perfect for office, kids room, or college dorm!